Crowns are a very common dental treatment. Crowns are suggested by dentists for a number of different reasons with the overall goal being to improve the strength of the tooth, make it a more uniform shape and size and give it a better appearance. A dental crown gets its name from the fact that it is positioned on the top of the affected tooth, just like a crown on top of someone’s head. However, a crown is actually a hollow cap that sheaths the entire tooth that is visible at and above the gum line. It is sealed in place so that it looks and behaves just like any other tooth would. There is also a variation known as ‘3/4’ or ‘Onlay’ crowns which cover the tooth to a lesser extent. Crowns are also often used purely for cosmetic reasons as they can improve the overall appearance of the tooth. 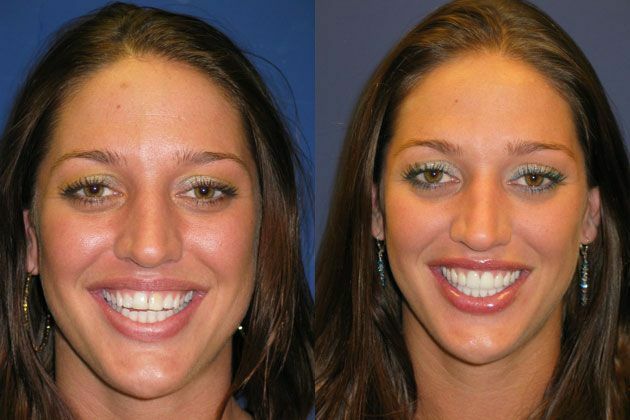 Metal crowns are usually the cheapest option and are most commonly used for functional repair. The majority of patients prefer to only use metal crowns deep inside the mouth; for example, on the molars, due to their metallic appearance. However, metal crowns are also some of the most resilient and can withstand heavy use much longer than other varieties. They are also near impossible to chip or crack. Stainless steel crowns are most usually used in adults as a temporary cover for the tooth while the final crown is being created from the final choice of material. They are fast and simple to fit, which is also one of the reasons why stainless steel crowns are almost always the only variety used on infant/first teeth. When it is time for the infant tooth to fall out, the crown comes away easily with it, leaving a hopefully healthy adult tooth space to come through and replace it. These types of crowns are made from metal that is fused to an external porcelain covering, giving them a more aesthetically pleasing appearance as they can be color-matched to your existing teeth. Porcelain/ceramic finish crowns are the most cosmetically pleasing, being able to be closely color-matched with the existing teeth to produce a flawless look. They are also suitable for those patients with metal allergies. Unfortunately, they are not as strong as their metal/porcelain mix counterparts. One of the cheapest types of crowns, all resin varieties probably have the biggest vulnerabilities to wear and tear and breaks. Crowns normally require a couple of visits to Vero Dental Spa. During the first visit you can expect several things to happen. Firstly, the doctor may decide to take x-rays of your teeth to determine the extent of the damage both above and below the surface to be certain that a crown is the correct treatment. Then you will have your mouth anesthetized and your doctor will file your troublesome tooth to make space to fit the crown around it. How much filing is required will vary depending on the type of crown that you are having as some require more or less space. However, if your tooth is already much smaller than it should be, perhaps due to breaks or decay, then your doctor will probably use filling material in order to make it large enough to support the crown. Once this has taken place he will use special dental putty to take an impression of the tooth that requires the crown, and of the surrounding teeth so that the dental lab can ensure that it will be a perfect fit. Your doctor will then send the impressions to the lab, along with a recommendation on color for porcelain or ceramic crowns, to be made for your return visit. Finally, a temporary crown will be fitted to protect the tooth until your permanent crown is ready. During the second visit your doctor will give you anesthetic and remove the temporary crown. Checking that the permanent crown is a good fit and color, it will then be firmly secured in place. Just as it is important to look after your normal teeth, it is also important to give your crown proper care and attention, even while you only have the temporary version in place. Avoid particularly hard, chewy or sticky food which could cause damage to the temporary crown or risk pulling it out. Switch to side flossing rather than vertical flossing. Pulling particles out side to side reduces the risk of pulling the crown out. Once you have your permanent crown in place you should resume with your normal oral hygiene routine including brushing, flossing and using mouthwash regularly, paying particular attention to the area where the crown meets the gum. Looked after properly and depending on the amount of stress or use it receives, your crown could last between 5 to 15 years.